Molly Tsongas, Rachel Banay, and Page Stites, co-directors of Middlesex Graduates for Estabrook, along with supporters, friends, and family marched their banner across the Middlesex campus late yesterday afternoon. 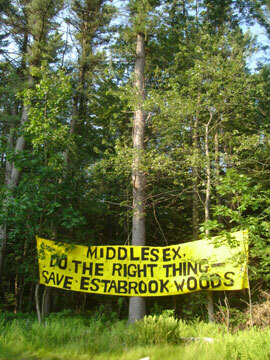 The banner, which read "Middlesex, Do The Right Thing - Save Estabrook Woods," was 35-feet long with 16-inch black letters on a yellow background. The alumni marched straight across the campus and into the Estabrook Woods, where Middlesex has already cleared approximately 4 acres and constructed tennis courts. They hung the banner in the trees at the edge of the clearing and concluded their 36-hour protest. Early on the morning of July 17, Molly Tsongas '00 and Rachel Banay '03 ascended two trees along Lowell Road and hoisted a large yellow banner. They represent Middlesex Graduates For Estabrook and are staging this action to protest the school's development of the Estabrook Woods and to invite the school to attend a mediated negotiation to resolve the 14-year struggle over the development of the woods.